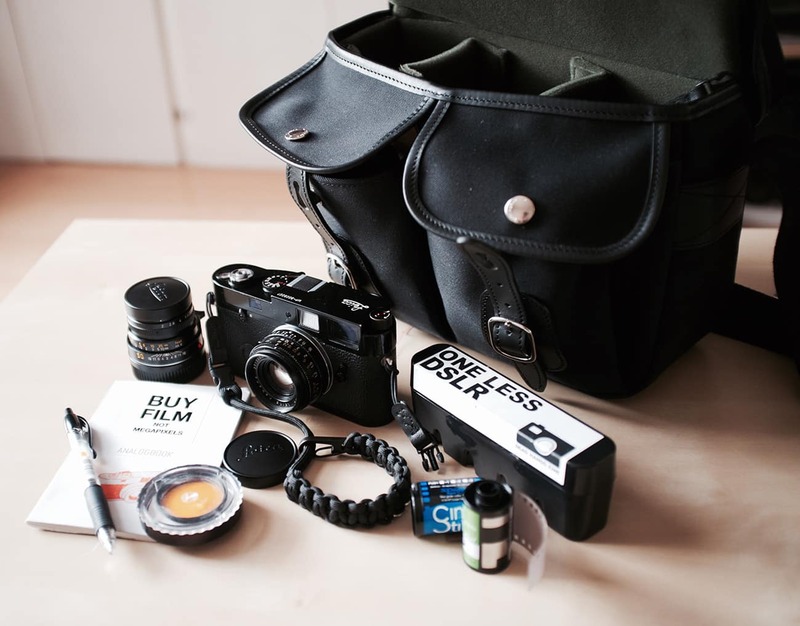 Derek shares with us a delightful combo bag, with a mix of formats and gear. Come and check out this multipurpose bag. Hello! 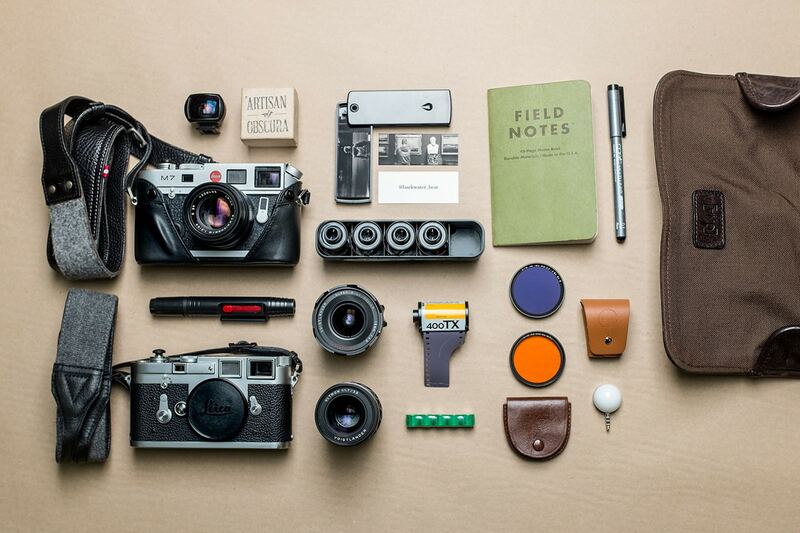 love the site and especially the bag shots. My name is Derek and I am from San Francisco. I’ve been enjoying the site for a while and figured I’d finally submit. You will see I show no brand or format loyalty. 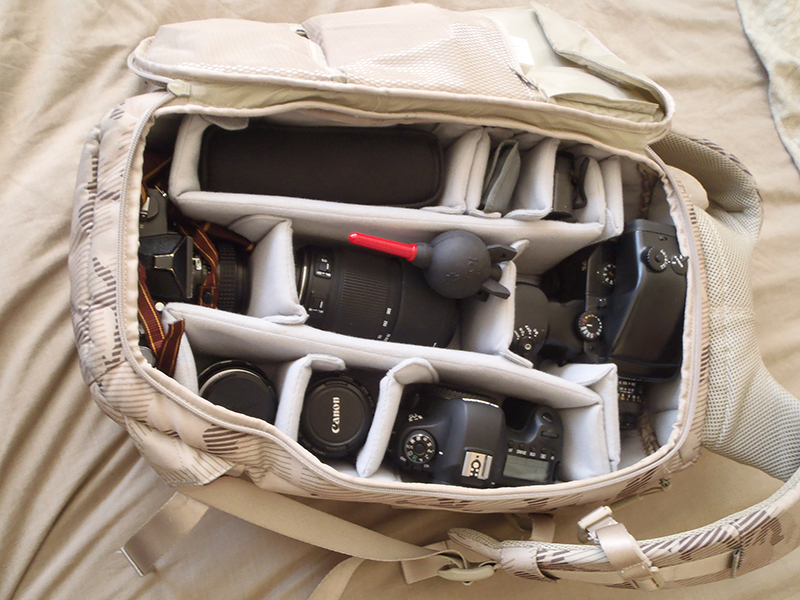 Bag – Incase DSLR pro pack. 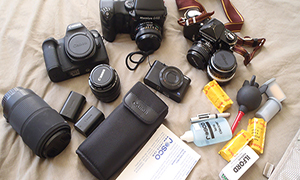 Incredibly spacious, yet very comfortable, and when it’s all zipped up it’s very discreet and does not scream “camera bag.” It’s quite rare that I cary all of my gear with me at once, but it’s great knowing that I can. There’s even room inside to fit my laptop, pen and paper, a jacket, and can easily strap tripod/light stands to the sides. Canon 6D – Relatively small and lightweight, incredible full frame picture quality, and just feels really good in your hand. I don’t know why you would ever choose to pay so much more for a 5d when this camera is so good. Currently only own a 28 prime and a cheapy off brand 70-300 zoom, but am hoping to add a nice L series standard zoom soon. 580 ex ii speedlite and generic off brand wireless triggers. Sony RX100 – Absolutely love this camera. It goes with my everywhere. 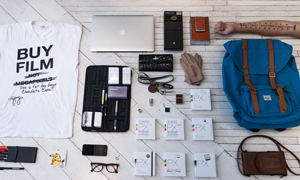 Fits unnoticeably into any pocket and has incredible picture quality. Often times, I wonder why I even have my Canon when this thing is so good! 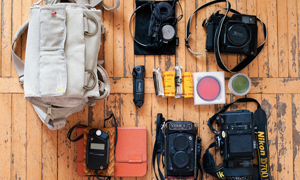 Nikon Nikkormat – Delightfully simple and easy to use 35mm camera. I love that all of the controls are in one place, around the lens. Lightmeter is incredibly accurate. It’s really just a joy to shoot. Armed with a Tokina 28 and Nikkor 50. 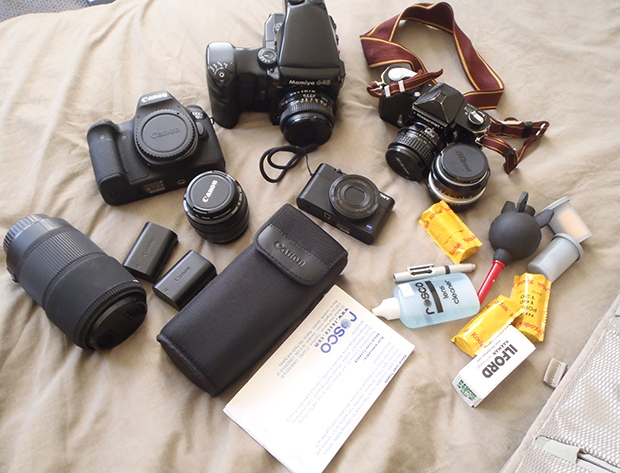 I primarily use this for street photography. As much as I love this camera, I may be replacing for a lighter, smaller rangefinder in future. Mamiya 645 Pro – Got this from a friend for an incredible deal and I could not be more pleased! Was lucky to get it with the auto exposure prism and auto winding grip. It’s big, heavy, and noisy, but is so great to shoot! After getting my first roll of film processed I could not believe how big a difference the medium format performance had. The detail, colors, and dynamic range completely blew me away. Sadly for me, I had bought this as a gift for my girlfriend so it is no longer in my possession, though I am glad she can enjoy how great it is. I prefer to shoot on Kodak Portra (160 and 400) for color and Illford HP5 for b/w. Thanks for sharing your bag with us Derek. It is not often you see someone carrying a 645 Pro. Loved the blog images, I feel your personality comes through well in your imagery! Nice set of images, I just love the California sky, makes a change grey winter cloud in the UK. Keep up the good work, I’m quite temped to start a Tumblr Photo Blog after looking through yours. Presumably, that bag is for storage, rather than every day carry?